What’s the Best Reward to Risk Ratio for Forex Trading? Your reward to risk ratio is an important part of any successful Forex trading plan (or any trading plan for that matter). It’s not an arbitrary number that you can just choose for more profit. It has to actually work. In this article, I’m going to show you why your reward to risk ratio is one of the most important aspects of your trading system. I’m also going to discuss the pros and cons of raising or lowering your reward/risk target and give you some practical tips on what works in different scenarios. What is Your Reward to Risk Ratio? In trading, your reward to risk ratio is defined by what your profit target is and how much you are risking per trade. For instance, if you’re shooting for 100 pips, and you’re risking 50 pips, your reward to risk ratio is 2:1 (100/50=2). You are shooting for twice what you are risking. If, however, you’re shooting for 100 pips, and you’re risking 100 pips, your reward to risk ratio would be 1:1 (100/100=1). You would be shooting for the same amount of pips that you have at risk. Note: The reward to risk ratio that you shoot for is not the same as your actual reward to risk ratio, which can be affected by breakeven trades, trailing stops, closing trades early, etc. The reason your risk to reward ratio is so important in trading is because with a 1:1 ratio and a 50% strike rate (win rate), you would break even. In fact, you would end up losing money due to spread costs, commissions, and any other operating fees. However, with a 2:1 reward/risk ratio and a 50% strike rate, you would make plenty of profit. 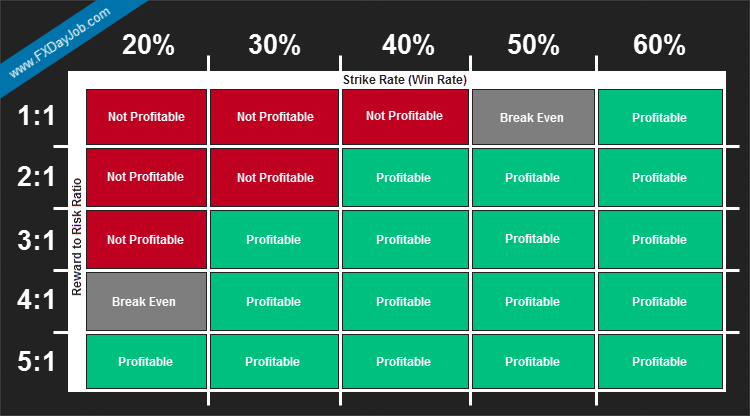 In fact, you could still be profitable with a 35% strike rate (not counting trading fees). Of course, realistically, depending on the rules of your trading system, you will not reach your full profit target on every winning trade. For instance, you may need to exit early with a partial profit before a big news event. As you can see from the graphic above, the higher your reward to risk ratio is, the fewer trades you need to win to be profitable. So why not just shoot for the moon? Why not go for a 10:1 ratio? The obvious advantage of targeting a better risk to reward ratio is that you can be profitable with fewer wins. However, the bigger your profit target is, the less likely it is that you will hit that target (see the image below). In the example above, we took a bullish engulfing candlestick pattern as our entry. Stop loss is in the standard position. You can see that a 1:1 and 2:1 reward/risk were fairly easy targets, and we could have even gotten 3:1 before running into our first major resistance point. However, the market never quite made its way up to the 4:1 level, and reversed well before the 5:1 level. This was an exceptional example of a bullish reversal too. Most trades will not go 3:1 in your favor. The reward to risk ratio that you target could vary depending on the trading system that you’re using. 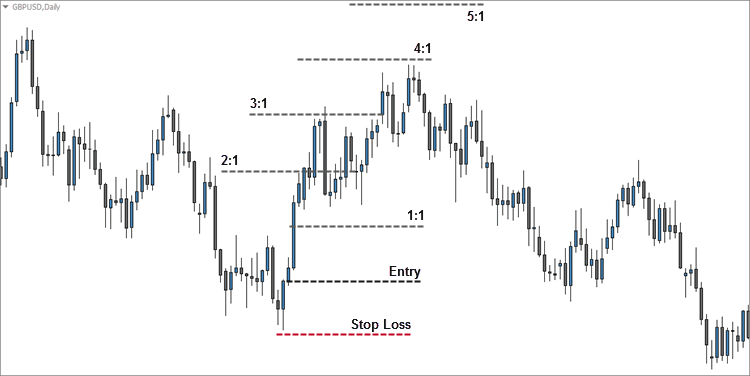 At Day Trading Forex Live, we use a 2:1 ratio. The Infinite Prosperity and Top Dog Trading systems both use a stepping stop loss method, so there is no set risk/reward ratio. When I’m trading Japanese candlesticks, I usually target a 2:1 reward to risk ratio. There are exceptions to the rule. In the image below, you can see two bearish harami candlestick patterns followed by a bullish harami candlestick pattern. In my opinion, it’s necessary to shoot for, at least, a 3:1 ratio with the harami patterns, because they’re not strong patterns, so they don’t work out as often as some of the stronger signals. Note: The harami patterns will usually give you nice risk to reward scenarios that have a realistic chance of working out because the small second candlestick in the pattern usually keeps your risk (in pips) relatively small. As you can see from the image above, a 3:1 ratio works out well for the harami patterns. Sometimes you can even profit from these patterns during small retracements (notice the first trade on the left). 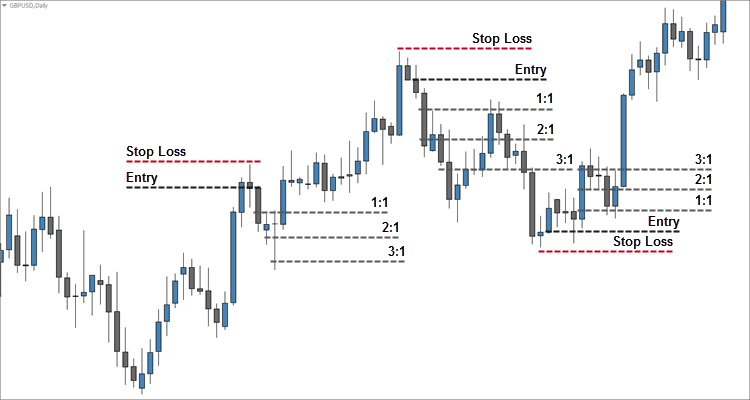 As a general rule of thumb, 2:1 or 3:1 is a good reward/risk target in Forex trading (or any type of technical trading). It really depends on your trading system and what kind of follow through you can expect from your trading setups. Scalping traders often shoot for a 1:1 ratio or less. Instead of a high reward to risk ratio, scalpers rely on a high strike rate for profits. Those same scalping systems would not work if you adjusted the reward to risk ratio much higher because scalping setups typically have very little follow through. Position traders often aim for 10:1 ratios because they are entering positions based on long-term fundamental or technical triggers. Your reward to risk ratio needs to be determined by what kind of setup and follow through your trading system actually provides you. 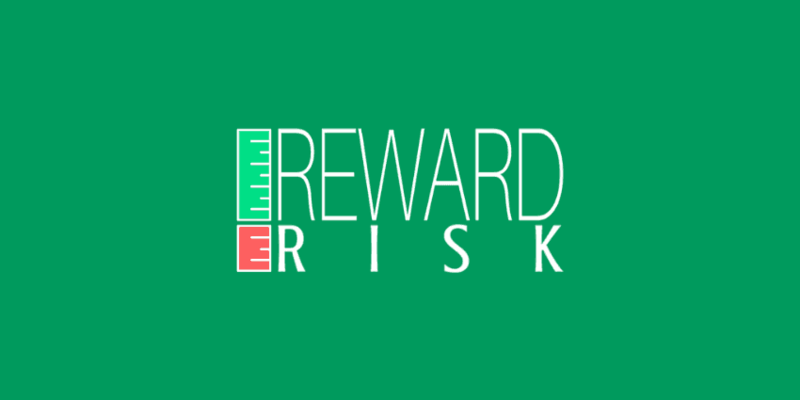 How do you find the ideal reward to risk ratio for your trading system? If you’re creating your own trading plan, you have to do lots and lots of back testing and demo trading to see what works for you. So what reward to risk ratio do you personally target? What’s your strike rate? Have you found a winning combination? Leave a comment below to let me know.